If you are looking for information on the Deck Rescue franchise business opportunity, Deck Rescue franchises or Deck Rescue franchising, then you have come to the right place. Tired of commuting to work every day in rush-hour traffic to receive little or no job satisfaction? Not a big fan of driving in dangerous winter conditions amidst thousands of over-caffeinated, potential "road rage" candidates? Ever wish you could live life on your own terms, dictating where and when you go to work? Then a Deck Rescue franchise might be right for you. David Hydock, President, recalls, "I worked in the corporate world in Cleveland after graduating from John Carroll University in 1992. The garage space for my car at home was bigger than my work cubicle... I found that somewhat disheartening. I remember saving my vacation days for the winter, so when a blizzard hit I could stay home. Why risk my life driving to my job, knowing that no matter how hard I worked, someone was going to profit more from my labor?" With a Deck Rescue Franchise, by the third or fourth year the business begins to kick into 'cruise control.' By then, the repeat and referral business will be coming in quite steadily. 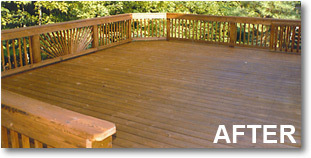 Decks have to be restored every couple of years, granting you perpetual job security. 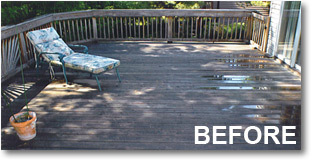 By utilizing Deck Rescue's system of restoring a typical-sized deck in only two hours, you will be able to handle the steady stream of jobs coming in. In addition, by learning these techniques from one of the most award-winning contractors in the nation, your profits will not be compromised by time-consuming callbacks and complaints. A franchise system in general is a phenomenal concept. In the case of Deck Rescue, you learn over a decade of business expertise in only two weeks, eliminating fatal errors and pitfalls that could ruin your business. You receive ongoing corporate training and support. You share in our corporate discounts on equipment, advertising and chemicals -- all of which contribute substantially to higher profit margins. Furthermore as the franchise system grows and an entire region is established, we contribute dollars toward 'system-wide' advertising. This gives you the opportunity to purchase large-scale advertising such as TV, newspaper and radio that you could never afford on your own. The wood restoration market is intriguing. There are literally thousands of decks, fences, wood-sided homes, playground sets and other exterior wood structures. Yet, few businesses exist to power-wash and seal all that wood. Many people are under the perception that pressure-treated lumber does not need to be sealed or stained. However, horizontal surfaces like decks require treatment roughly every two years. Vertical surfaces like fencing and siding require treatment every four or five years. That translates into job security and peace of mind for Deck Rescue franchisees. "You no longer worry about your future, not knowing if your paycheck is secure. You truly feel for people whose jobs have been outsourced or eliminated, but it will never again affect you personally."